If it’s a little wacky, off-centred or just plain weird, you’re probably going to take a second look. Right? While that’s a simple Psych 101-esque statement, it’s probably why I saw two guys in their early 20s doubletake at the LCBO when they came across Muskoka Brewery’s Legendary Muskoka Oddity. The seasonal brew comes in a striking 750 mL bottle, corked and wired in, making it feel as if it should be out with the wines. The guys picked it up, admiring the artwork before their companions foolishly pulled them away. “They were going to enjoy that…” I thought. Oddity hit the shelves last week. I had the chance to sample the Belgian-style ale about a week previous, before it was completely aged and ready for sale. I was impressed, and even more so when I drank the final product this week. This edition of Oddity is slightly different than the version Muskoka Brewery released last year. They’ve added more juniper berries, as well as bitter orange peel, trappist yeast, and Sorachi Ace hops to go alongside the sweet orange peel shavings and heather tips (which they’ve pared back on this time around). Branding Manager Jason Dawes says they were fortunate to have the hops in reserve, since Brooklyn Brewery placed a huge order making them hard to come by. The juniper and orange peel really jumped out when I poured my first bottle. It had a very sweet beginning that didn’t dissipate too much. On my second bottle, though, the bitter orange peel really popped on the finish. That sour, pith-like taste lingered (in a good way…really) with just a hint of the alcohol showing through. Oddity’s ABV weights in at 8 percent, which gives it a nice warming aftereffect. Muskoka Brewery recommends pairing Oddity with food such as calamari, guacamole, and baked white fish. I say, however, it’s best on its own. This is a very complex beer, and worth sampling on a few occasions to taste any subtle differences. 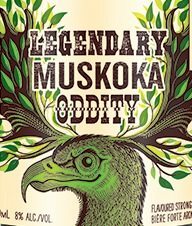 Legendary Muskoka Oddity is available at the LCBO (#290973) for $9.95.